When we use a microscope we do not look at the object directly, but at an image of it. Therefore – like a painting or a sculpture – the microscopical image is only a representation of the object, and that image can be altered by the quality of the microscope, its objective lens, and how light interacts with the specimen. Our eyes are the extension of our brains into the outside world, and how we perceive images can vary from one person to another (e.g. colour blindness), and we are more prone than we care to admit to optical illusions. Anamorphic mirrors help us realise how dependent we are on our eye-brain combination before we believe the ‘evidence’ of our eyes. Visit John Russ’ webpage, which has a lot of useful information. The PDF by John Russ on Seeing the Scientific Image can also be downloaded from his site (please be aware that it is nearly 50 pages). This information has also been published in an expanded form in the Image Processing Handbook. Figures 23, 27, 35 and 36 are available as *.mov files from John Russ’ site. If you want to play these on a PC, you should use VLC Media player which is open-source freeware. 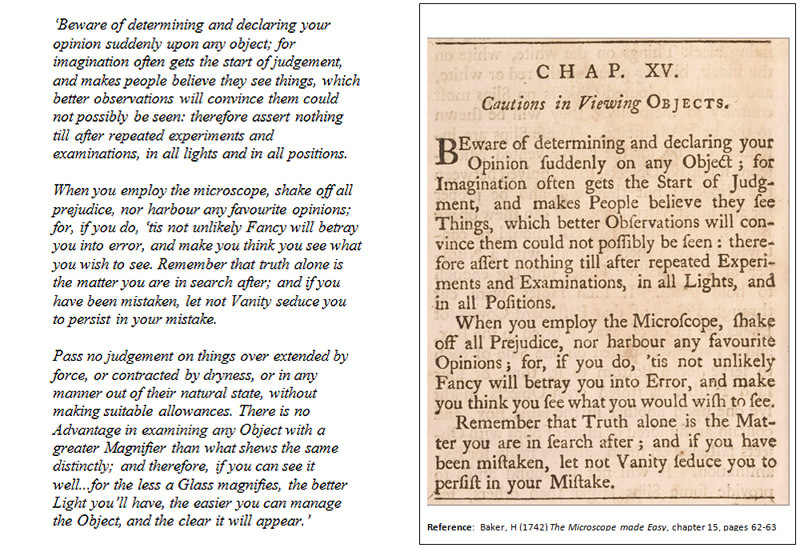 Henry Baker (1744) The microscope made easy pages 62-63, 3rd Edn. London. Russ, JC (2004) Seeing the Scientific Image Proc. Roy. Microsc. Soc. 39/2:97-114; 39/3:179-193; 39/4: 267-281. 1. Michael Bach - This page of Michael’s is a fascinating webpage. He’s an opthalmologist at the eye hospital at the University of Freiburg. Have a look at the lilac chaser; have a look, also at his page on visual acuity.